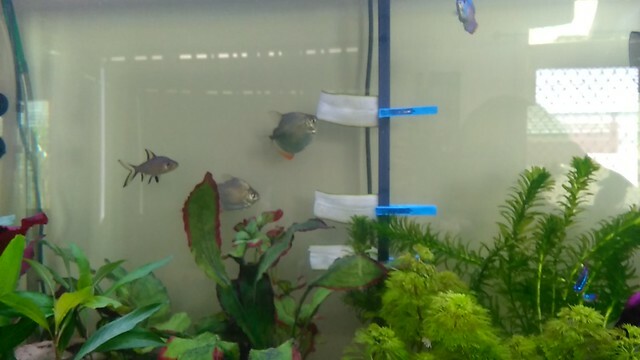 We have a 3ft tank donated by our boys teacher. 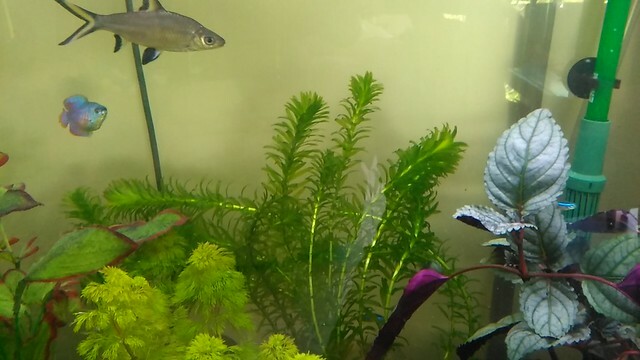 Since receiving the tank we have stocked it with Silver Sharks, Tetras, Cory's, Betta, Bristlenose, Silver Dollars, Mystery snails and the latest addition a Clown Loach that my boys named Jeffrey. In hindsight this was probably not a good idea, but we were blissfully unaware until the fish started eating the snails, poor things. 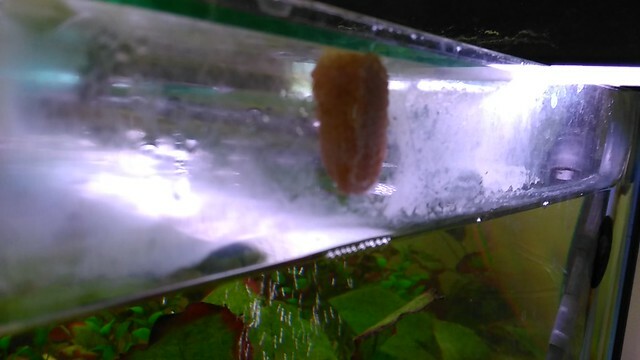 Anyway we now have two lots of snail eggs and our boys want to let them breed. 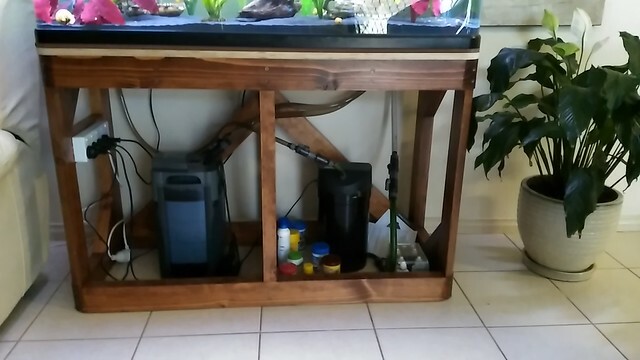 I had since purchased a couple of tanks so decided to get one ready to take the predators out of the soon to be breeding tank ! Photos will show the journey so far. Lots of snail eggs, one lot seems a bit dry despite me sealing the top with tape to keep moisture up. 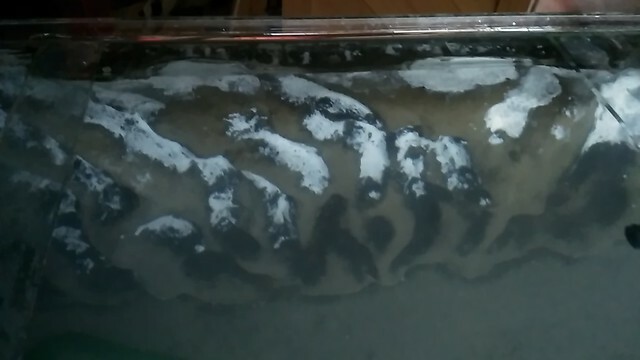 The next tank had a 3d background which was looking pretty ordinary so I decided to renew it, I mixed a plain mortar with a water base paint colour to create different colours. I am an amateur and the results show it lol. After drying I filled with water and tested PH, wow off the chart high bright purple ! Water change straight away, PH from tap is about 7 so according to Google the mortar mix is pushing up the PH level. 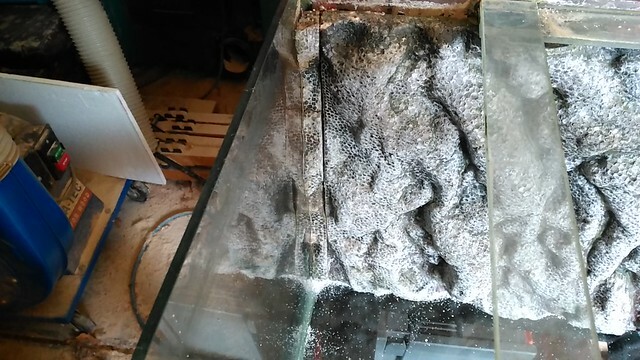 Well I thought it would be good idea to add some 'Constant PH 7' to try and control it. Again not my best idea, woke the next morning to a plethora of white 'stuff' growing on the new background. 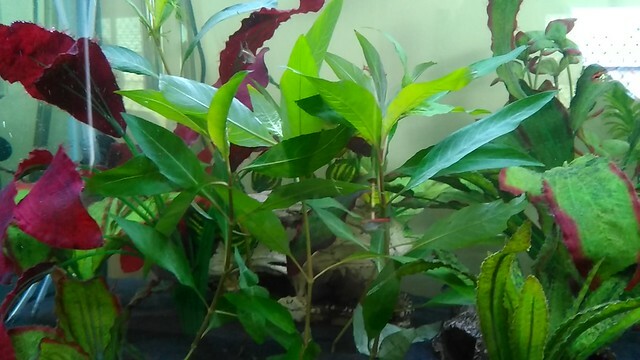 Google indicated this was not a real problem so I started 100% water changes each afternoon. I think I am on change no 4 today and the white 'stuff' has reduced a lot, the PH is still high before each change. Hope it settles soon as we are running out of time for the snails hatching, another week is about when they will start hatching according to Google etc. If you havent sealed the mortar with a fish safe sealer then the leaching of the lime (PH UP) will continue for a long time. By adding a PH reducing agent before the motar has fully set, and this takes weeks, you will be breaking down the mortar. This is the same, but not as severe, as a brickie using an acid wash to clean the mortar off bricks when he finishes a job. This is the bit that you may not want to hear. Pull the background out and let it fully dry, depending on the temperature a couple of days. 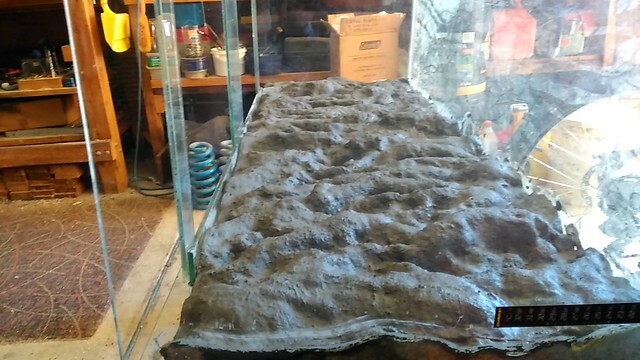 Get something like Crommlins clear pond sealer and give it 2 coats and let it dry for 7 days. Put it back in the tank and start with fresh water. I will try and pull the background out but I think it will wreck my mortar job. Might leave it in and wait the weeks and seal. 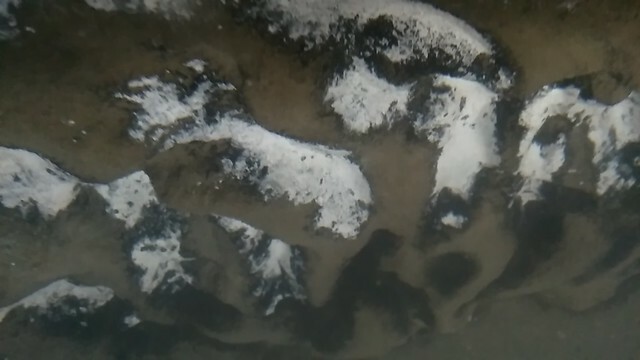 The white stuff should be gone by then. 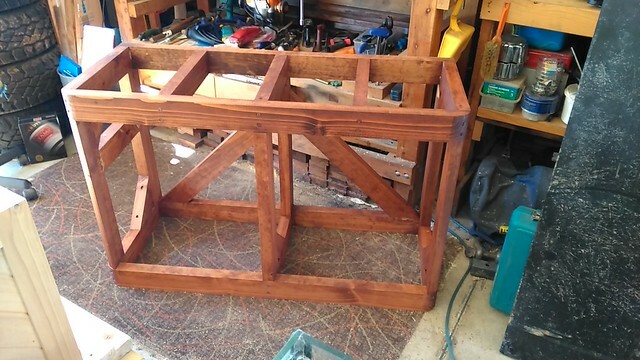 I can make the frame for the curved front 4ft tank and get it running, was always going to be in the lounge room so wont hurt to not have the cabinet doors/sides on for a while. 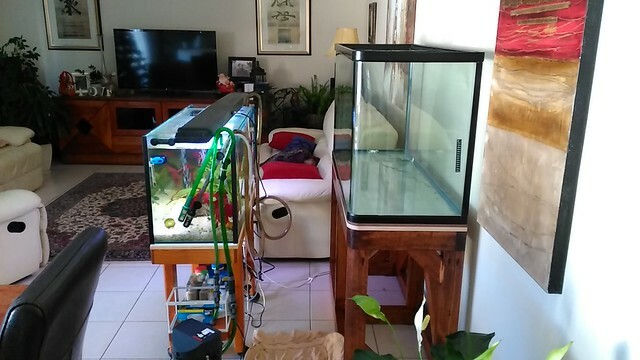 You could use the tank to house some Africans (fish... ) rather than trying to change up the background... They like it alkaline etc. You can still have some tough plants etc. 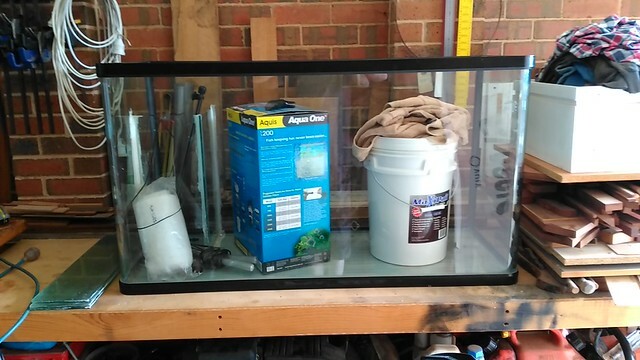 I will get the big tank ready, trying to work out how I can make the frame in a short time. 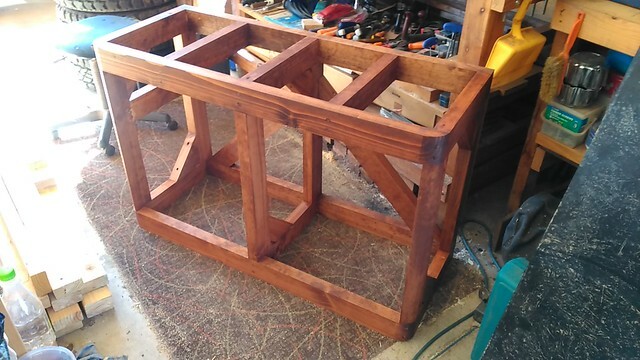 I have been busy making the frame for the 4 foot tank. I priced some hardwood and to get it local quickly was going to cost over double what I would normally pay from the timber mill. Plan B, drove to our work yard and grabbed a heap of 90 x 45mm pine we salvaged from our concrete formwork jobs. Seems I am doing a lot of plan B's lately lol. Then dressed the best pieces to 85 x 41mm. I think the tank, gravel, rocks and water will weigh around 400 kg so needs to be sturdy. I don't trust pine and would much prefer hardwood. Anyway lots of bracing, 10g x 100mm screws and waterproof polyurethane glue in all joins. Probably over engineered but it should last. My first question about the tank, is the plastic top brace enough or should I silicon some glass across there ? 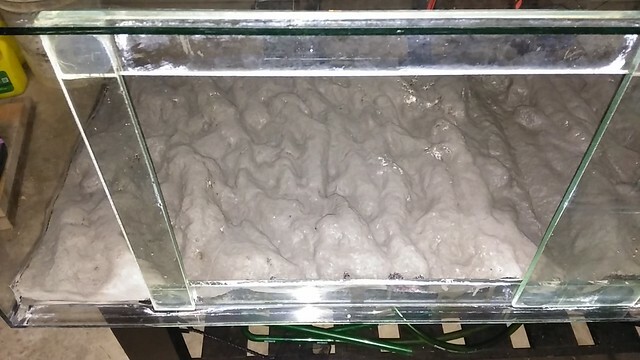 The glass is 10mm thick and tank measures 1200 x 470 x 650 mm high, I calculated approximately 300L plus the gravel, rocks etc. Some pics as to where I am at now, have stained the frame so it will better blend with the Blackwood skin when I make it. 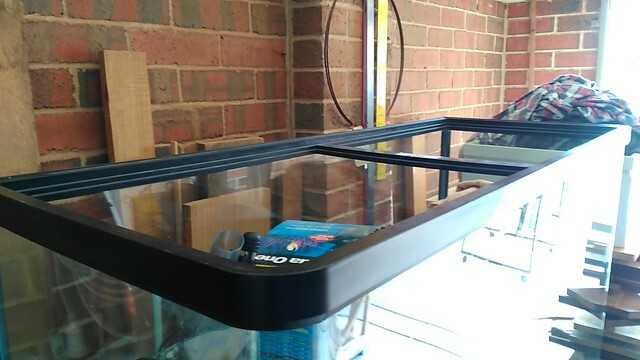 Couple of coats of clear sealer to follow tomorrow and then I can clean the tank and get it set up ! Probably over engineered but it should last. That tank looks like an Aqua One and i would be seriously surprised if it is 10mm thick. Anyway the bracing was designed for the tank and will be good for years. Cross bracing wouldnt hurt and would give you peace of mind. I am not sure what brand the tank is, I could not find anything on or under the tank. The top comes off easily, not sure if I should be concerned ? Definitely 10mm glass. 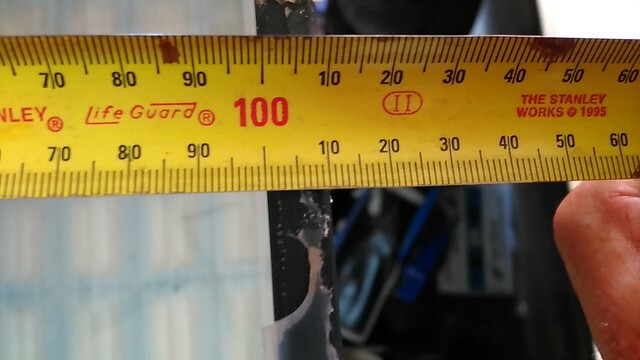 The plastic bottom has a kind of grid of plastic with a thin foam sort of material between glass and plastic, seems to be reasonably well made. The glass is in great condition, no scratches. I bought it via gumtree for $150 a bargain I thought ! 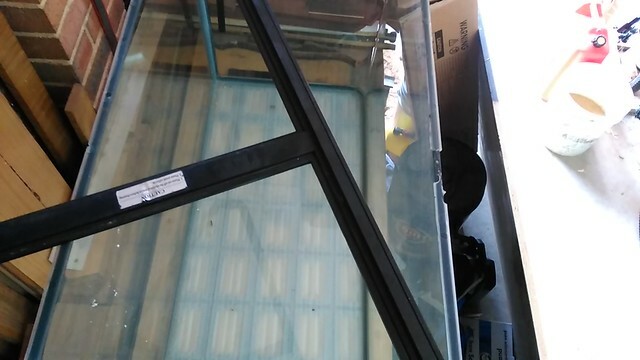 Just clean the silicone of the top of the glass and reattach the surround with new Aquarium safe silicone. Last edited by mundi; 21-12-16 at 07:35 AM. The NZ iron sand arrived, spent the best part of a day washing it. Still slightly cloudy but getting better. The four foot tank dwarfs the three foot ! 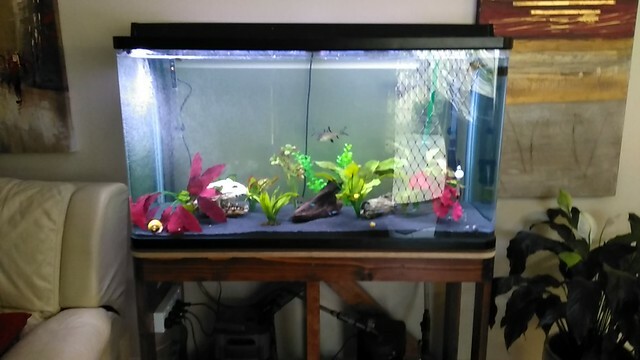 I have more tall plastic plants ordered so will fill the top half a bit more. Also on order is a make my led with the sunrise/sunset timer. Love the black sand and so do the Cory's and the Bristlenose ! I will make some sort of shelf inside the cabinet and tidy up all the wiring, I want to see how it works for a week or so until I decide where to put everything. 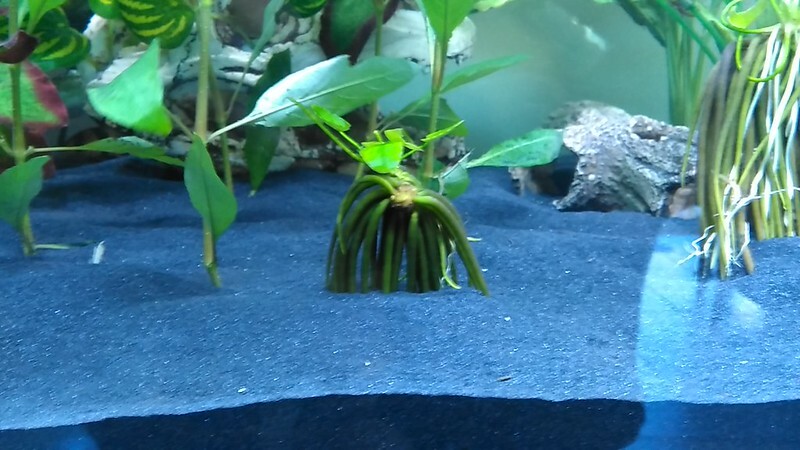 I want easy access to one of the filters for weekly wc and leave room for future CO2 when I replace the plastic with real plants. Nice looking tank and great choice of sub. It is going to look fantastic when planted out. I would look at getting some plants sorted and ordered now, before the light arrives, just to get started. They are going to take a while to get settled. The plants are starting ! 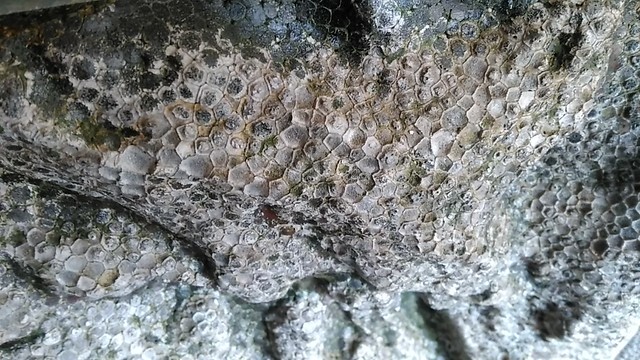 I have no idea about them which shows as the Silver Waffle is not an aquatic plant ? Never mind when it starts dying i will replace it. 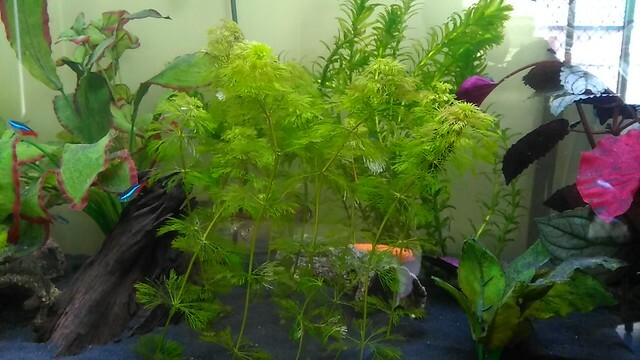 Also grabbed some Elodea, Ambulia and Blue Stricta. Anyway will see how they go. I will gradually replace all the plastic plants with real ones if I learn how to keep them alive ! 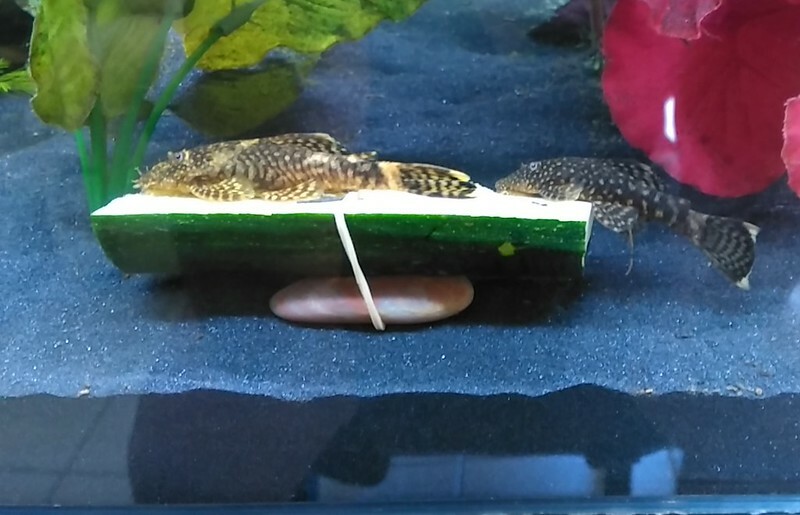 I noticed the other day the Silver Dollars were hopping into the Bristlenose's Zucchini so I peeled some for them, looks out of place but they love it. 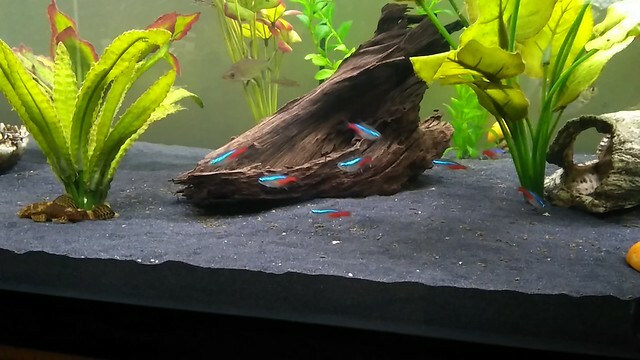 Might keep them off the Ambulia for a few minutes. 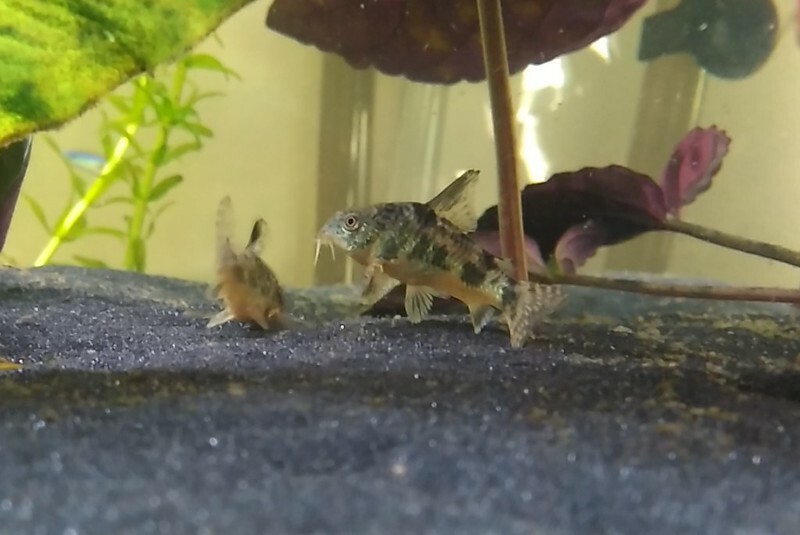 Still young but I think we have a male and female Bristlenose, both pictured below. The boy is almost twice the size of the girl (? not sure) they were the same size when purchased. Good work. Your planting technique is fine. With that purple plant, try it in a pot outside. 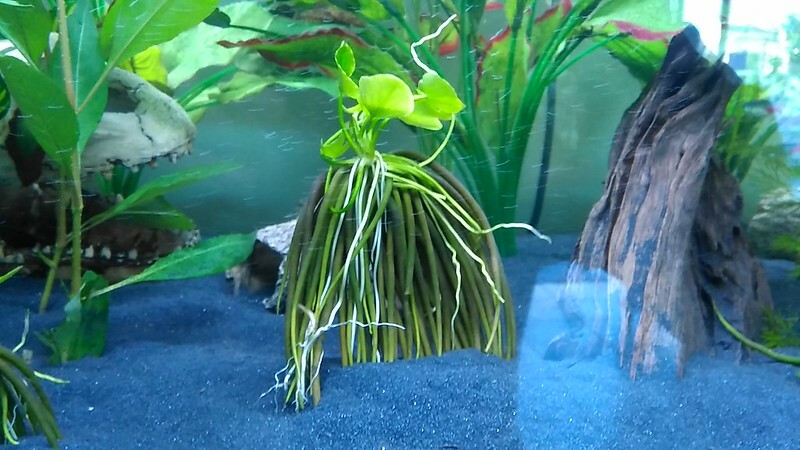 I grabbed a couple of unusual looking plants today and a large piece of driftwood. 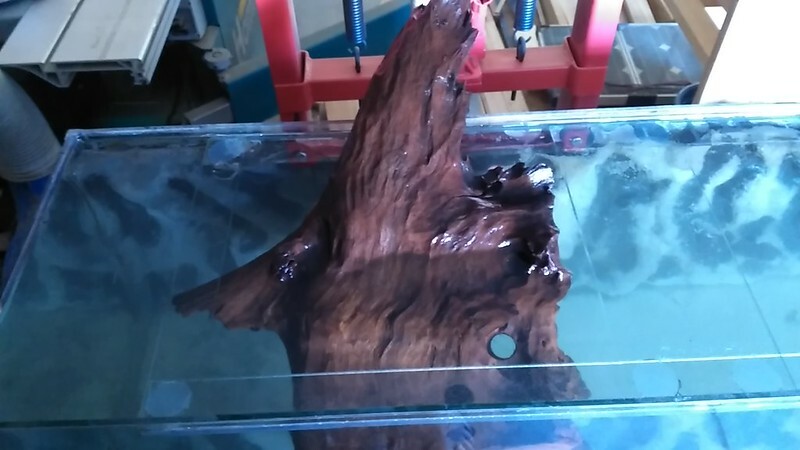 Bored a few holes in the base of the driftwood for the Bristlenose to hide in. 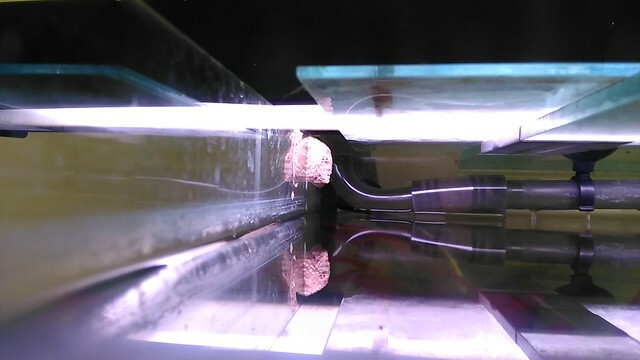 It wants to float so I will leave it to soak int the other four foot tank until it sinks. Don't know how long it will take, small bubbles still coming out of it after a few hours. 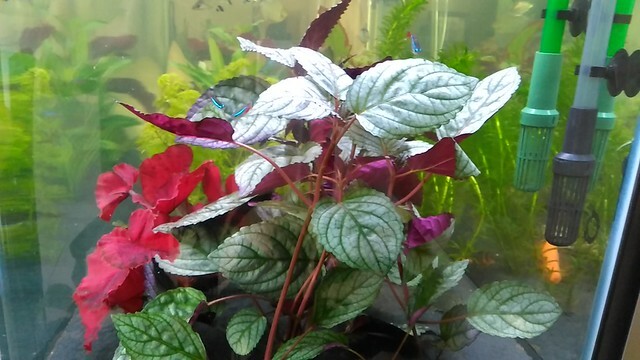 Anyway I cant find the name of these plants, can any of you guys identify them ?